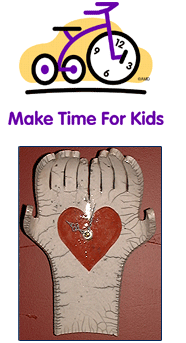 Sponsored by Taylor Orthodontics, Make Time For Kids is an auction event to benefit the Chaves County CASA Program. The public is invited to share in this free gala event. Clockworks and clock hands are available at Taylor Orthodontics. Clocks can be dropped off at Taylor Orthodontics at 200 West Wilshire, Suite E.
At our last event over one hundred clocks in all sizes, shapes and mediums were donated and auctioned on behalf of CASA’s services for abused children. Artists, craftspeople, and community members are invited to create and donate unique clocks for the event. Donations of clocks are tax deductible. Clocktail Party - Come get clock parts and ideas! 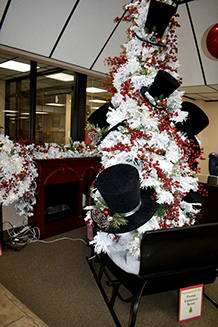 Winter Wonderland is an auction featuring one-of-a-kind Christmas trees and decor created and donated by members of our caring community. Proceeds from the auction will benefit the Chaves County CASA Program’s work with abused children. CASA is deeply grateful to First American Bank and Xcel Energy for their creativity and generosity in sponsoring this event. It does indeed make a difference. All donations are tax deductible. CASA Giving Trees CASA Giving Trees will also be on display at the bank. The Giving Tree supports the children that are served by the Chaves County CASA Program. CASA serves over 1100 children per year who are abused, neglected, abandoned, sexually molested, high risk, or victims of domestic violence. Many of these children are profoundly underprivileged - many have never been given a gift. The Giving Tree supports the children that are served by the Chaves County CASA Program. CASA serves over 2000 children per year who are abused, neglected, abandoned, sexually molested, high risk, or victims of domestic violence. Many of these children are profoundly underprivileged - many have never been given a gift. Trees and baskets throughout the community have Giving Tree Cards that hold the Christmas gift wishes of CASA children. 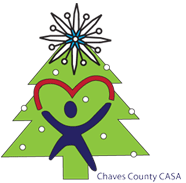 In December Chaves County CASA holds a CASA Kids Christmas Store where foster parents and disadvantaged CASA families can come shop for free from among the hundreds of gifts donated by the community.